The geological time scale is Earth's history divided into a series of named time intervals seperated by significant events in Earth's history. The largest defined unit of time is the supereon (not shown on this chart). This composed of eons which are then divided into periods and epochs. How are fossils dated? The last ice age recedes, bringing with it a 400 foot rise in sea level. Major ice age where continental glaciers cover much of North America and Europe. Pleistocene mega-fauna flourish including mammoths, mastadons, giant sloths, horses, bears, etc. Evolution of anatomically modern humans. Neandertals, Homo erectus and Homo sapiens appear. Ape-like ancestors of modern humans. Global climates cooled and became dryer with the onset of glaciation cycles. Plants and animals of the Miocene were fairly modern. Mammals and birds were well-established. Whales and seals spread. The Megalodon ruled the seas. Mountain building took place in western North America, Europe, and East Asia. Rapid evolution and diversification of fauna, especially mammals. Major evolution and dispersal of modern types of flowering plants. Archaic mammals flourish and continue to develop. Appearance of several "modern" mammal families. Primitive whales diversify. Climate tropical. modern plants appear. Mammals diversify into a number of primitive lineages following the extinction of the dinosaurs. First large mammals appear. Indian Subcontinent collides with Asia. Many new types of dinosaurs (e.g. Tyrannosaurs, Titanosaurs, duck bills, and horned dinosaurs) evolve on land, as do modern crocodilians. Flowering plants proliferate, along with new types of insects. More modern teleost fish begin to appear. Ammonites, belemnites, rudist bivalves, echinoids and sponges all common. Mosasaurs and modern sharks appear in the sea. Primitive birds gradually replace pterosaurs. Monotremes, marsupials and placental mammals appear. Major extinction at the end of Cretaceous kills off 3/4 of plant and animals includes dinosaurs. Many types of dinosaurs, such as sauropods, carnosaurs, and stegosaurs. Mammals common but small. First birds and lizards. Ichthyosaurs and plesiosaurs rule the sea. First dinosaurs being to dominate the land. Icthyosaurs and nothosaurs the oceans and pterosaurs the air. Landmasses unite into supercontinent Pangaea. 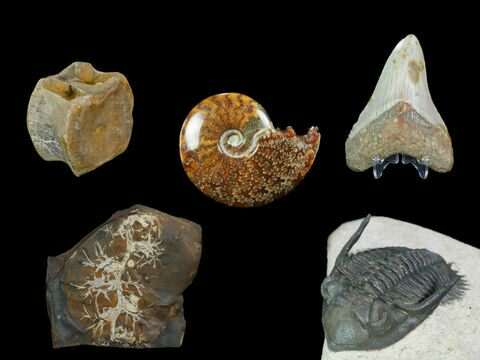 Mass extinction at the end of the Permain kills off 95% of all life on earth including all all trilobites, graptolites, and blastoids. Large primitive trees, first land vertebrates, and amphibious sea-scorpions live amid coal-forming coastal swamps. Early sharks are common and quite diverse. Trilobites begin their decline becoming much less diverse. Land colonized by plants and animals. Fish rapidly evolve become much more diverse and begin to rule the seas. Corals, bryozoa, goniatites, brachiopods and trilobites very common. First Vascular plants, first millipedes and arthropleurids on land. First jawed fishes populate the seas. Sea-scorpions reach large size. Corals, brachiopods, and crinoids all abundant. Invertebrates diversify into many new types. Early corals, articulate brachiopods , bivalves, nautiloids, trilobites, ostracods, bryozoa, many types of echinoderms (crinoids, cystoids, starfish, etc. ), branched graptolites are common. Conodonts (early planktonic vertebrates) appear. First green plants and fungi on land. Ice age at end of period. Major diversification of life in the Cambrian Explosion. Numerous fossils; most modern animal phyla appear. Appearances include: trilobites, priapulid worms, sponges, vertebrates, jawless fish, small shelly animals, conodonts, etc. Good fossils of the first multi-celled animals. Ediacaran biota flourish worldwide in seas. Simple trace fossils of possible worm-like animals. First sponges and trilobitomorphs. Enigmatic forms include many soft-jellied creatures shaped like bags, disks, or quilts. Possible "Snowball Earth" period. Fossils still rare. Trace fossils of simple multi-celled eukaryotes. First stromatolites (probably colonial cyanobacteria). Oldest macrofossils. First known oxygen-producing bacteria. Oldest definitive microfossils. Simple single-celled life (probably bacteria and archaea). Oldest probable microfossils. Indirect photosynthetic evidence (e.g., kerogen) of primordial life. Oldest known mineral, Zircon (4,404 ± 8 Million Years Ago). Formation of Moon (4,533 Million Years ago), probably from giant impact.